The Democratic Republic of Congo is trying to find its footing after a contentious presidential election in December 2018. These elections were preceded by months of political upheaval and poll delays. President Felix Tshisekedi is now in the driver's seat of Africa's second largest country, which is home to nearly 86 million people. Among the legacies he's inherited is a weak, incoherent and to some extent dysfunctional army, and generally beleaguered security forces. This is an issue that must be urgently addressed - especially because the United Nations' Stabilisation Mission in the DRC wants to reduce its presence in the country. This is partly in response to budget cuts for peace missions in general. Plans for a reduced UN mission presence include increasing transfer of security roles to the DRC government. But, as things stand, the mission's troops are the main source of protection for ordinary Congolese who must navigate between armed groups and oppressive and exploitative government forces every day. As my research has shown, the country's own security forces just don't appear ready to step into the gap. There have been significant improvements in terms of operational capacity, but the police, army and other security forces are still widely perceived as unprofessional. There is an urgent need to improve the training of both the army and the police, and to secure the needed equipment for forces to undertake operations and for logistical support. These are urgent and long overdue issues that need to be addressed. 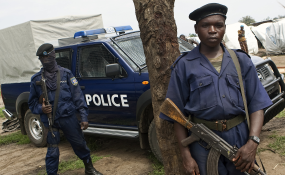 Congo's security sector reform programme was initiated in 2003. Fairly or unfairly, the programme has been judged a failure. This is because it hasn't yet integrated and transformed the non-state armed actors into well functioning national security institutions which operate professionally. But there have been some successes, which aren't often highlighted. Both the police and the army have been able to extend their presence in the country, and have deployed to most areas of the DRC. However, there is a distinction between being physically present and then being in control. My research shows that often the police and the army operate in collusion with the non-state armed actors, and the relationship is more symbiotic than antagonistic. My research shows that the army has pockets of well-functioning units. With donor support, it has managed to establish a network of military schools and colleges. It has also implemented a biometric payment system which has significantly improved salary payment to the soldiers. But corruption and misuse of funds is still a challenge - soldiers only get a portion of their pay via this system. There have also been some policing successes. The legal frameworks for the police and army have been passed by parliament. There's now a national database of police officers. Training programmes have been launched with the support of international donors. Still, there are undeniably problems. There are individuals and entire units in the army suspected of war crimes. And corruption and illegal activities are still rampant. The soldiers still need to undertake offensive operations, without having the necessary equipment or even, at times, ammunition. The police are in many ways in a more dire state. Since the force does not receive the same attention or funding from the government as the army does, it has largely failed to fulfil its functions of providing hands-on security to ordinary Congolese. Corruption, illegal activities and direct taxation - such as bribes payed by traders and motorists - of the people they're meant to protect are the order of the day in large parts of the country. A range of factors can help to explain the success or failure of any security sector's reform programme. Apart from prioritising legal and practical frameworks, the programme should have ﬁrm civilian oversight. Local ownership should also be a top priority. Local ownership means that the host government take on a leadership role and is the key institution in defining the needs and priorities of a SSR programme. But this is for many reasons tough to achieve, and has only happened to a limited degree in the DRC. Donors, too, can make or break reform programmes. This is mainly through a focus on their national political agenda and self-interest, bad programming and the imposition of 'oﬀ-the-shelf' initiatives on the country in question. My research illustrates that donor staff tend to use standardised tools while SSR programmes needs to be tailored to the local needs. This can result in ill-conceived equipment donations and maintenance contracts, or training programmes that are unfit for the recipient country's needs. The DRC is a classic example of this. Security reform programmes should take note of the local security realities. In the DRC compromises have often been made that have had a negative effect in the medium to longer term. This was for instance seen in the fast-tracking of integration of rebel forces. These units were generally not loyal to the government, but to their former commanders. Another example was the appointment of insurgent leaders to high-level statutory roles for which they had no formal qualifications. In the DRC priority was given to the need for stability and reducing risk, rather than to long term reforms of the security sector. This is partly why the country's security forces just aren't up to the task of properly protecting citizens. President Tshisekedi has a big task in-front of him. He is taking over a country still divided and in conflict with itself. Many ordinary Congolese are daily faced with the reality of armed non-state actors. On the other hand, are unprofessional national police and army in many ways operating like the armed groups. The DRC government needs to get the security reform programme back on track, and take real ownership of the process.